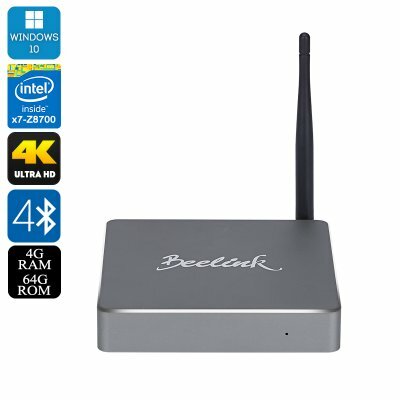 Successfully Added Beelink BT7 Windows 10 Mini PC - Quad Core 64Bit Intel Atom CPU, 4GB RAM, 64GB eMMC, Dual Band Wi-fi, 4K Support to your Shopping Cart. With its Intel Atom x7-z8700 processor and 4GB of RAM the Beelink BT7 is one of the best mini PCs on the market and brings incredible value for money. The quad core 64Bit processor runs at 1.6GHz with a burst frequency of 2.4GHz that kicks in when the going gets tough to ensure you always have a smooth and stable performance. The mini PC has an aluminum shell that allows for good heat distribution and a mini CPU cooling fan is there to assist whenever its needed, ensuring that the is no overheating and throttling of performance. A full version of Windows 10 is installed on this min PC brining you all the support for productivity apps and software as well as access huge spectrum of support software and games. Thanks to the Intel GPU this mini PC is able to decode 4K videos and display conmtent in vibrant resolutions. It makes a great media centre and will be sure to deliver a rich user experience. Having support for 2.4GHz and 5GHz frequencies this mini PC can wirelessly transmit higher volumes of data at spectacular speeds, alternatively you can take advantage of the Gigabit LAN port for even faster data transfer. So along with the 64GB of eMMC memory you can take advantage of fast connection speeds to expands the storage, ot use the SD card slot to add up to 1287GB of extra space.